Reka or river in English is of course a village by a river. It is precisely the Idrijca river, which attracts visitors to this village, may it be fishermen or swimmers, who want to cool off and relax in the summer months. The Divje Babe archaeological site in the precipitous slopes above the village proves that there was life here already in prehistoric times. And not just that, there was music too! The Neanderthal flute carried the reputation of the nearby area far across the world. The Reka tourist society is active in the village and its members try to introduce the village to as many people as possible through different activities. The most important tourist event in the village is definitely the series of events called Glas piščali or Sound of the Flute in English. Since the village is located at the main route through our municipality, a welcome fact for all the travelers and other visitors is that there are two bars open in the village. The renovation works on the Keltika road have recently been finished and during that two new accesses to the village and a new bus stop were built. The family woodworking business Masiva d.o.o. owned by the Makuc family has its seat in the village. An attraction of the village is the Church of St. Cantianus. A century ago when the world found itself embroiled in WWI, there was a military hospital in the village of Reka. There are no traces of it left today, except for the preserved documentary photos. The succursal Church of St. Cantianus stands on a steep slope above the village and was already mentioned in the record of visitation from 1595. A sacristy was built onto it in the period from 1880 to 1903. It had two bells, both supposedly bought in the village of Nova Oselica, but the bigger bell had to be given away before WWI. The design is late Gothic; there are three walled-in Gothic windows with a pointed arch in the presbytery. The church was probably redesigned in baroque style in the 18th century. The outside of the southern wall is decorated by a fresco from the 16th century, which depicts St. Christopher carrying Christ across water on his shoulder. According to folk tradition the Idrijca river never carried the bodies of the drowned any further than the village of Reka as St. Christopher was protecting them. On the northern edge of the Archaeological Park Divje Babe there is an archaeological site called Grad pri Reki, where several archaeological finds from the early Iron Age and the beginning of the roman period originate from. The remote hilly regions of Tolmin and Cerkno were annexed to the Roman state in the last decades of the first century B.C. 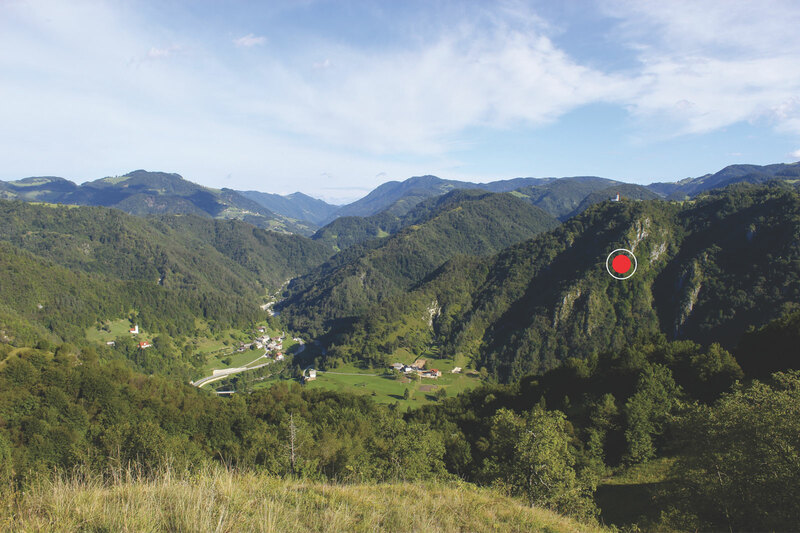 Objects dating back to that period give witness to how the Roman army besieged the strongholds of the native inhabitants on the Grad pri Reki and Gradišče near the town of Cerkno. The native inhabitants of these parts back then were most likely Karns, who inhabited the wider North-Adriatic outskirts including the regions of Karst, Notranjska and Posočje and all the way up to the town of Kranj as it stands today and where Octavian defeated them in the first two years of the Illyricum wars (35–34 B.C.). The similarity of the finds on both sites leave no room for doubt as to the fact that both sieges were a part of the same, larger military advance. 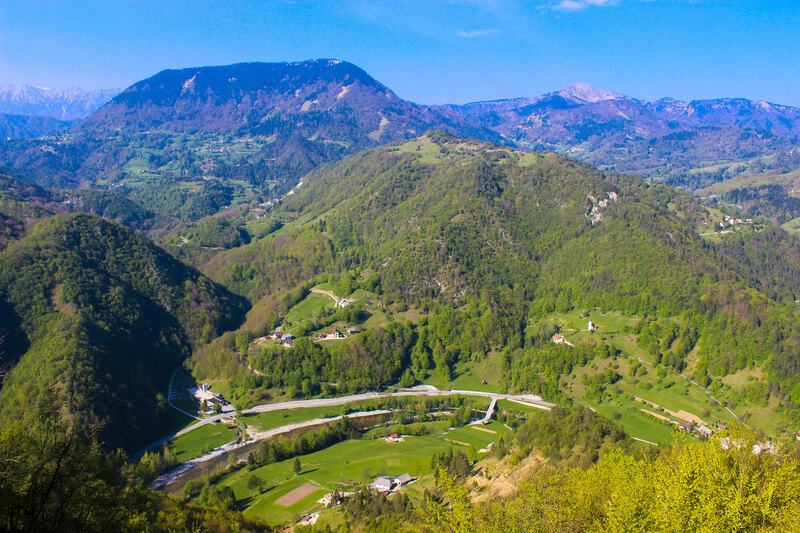 The Grad pri Reki, which lies on a ridge around which the narrow valley of the Idrijca river must make a bend, has so far been better explored. The red spot above the village of Reka (the upper right corner in the picture) marks the Divje Babe archaeological park. 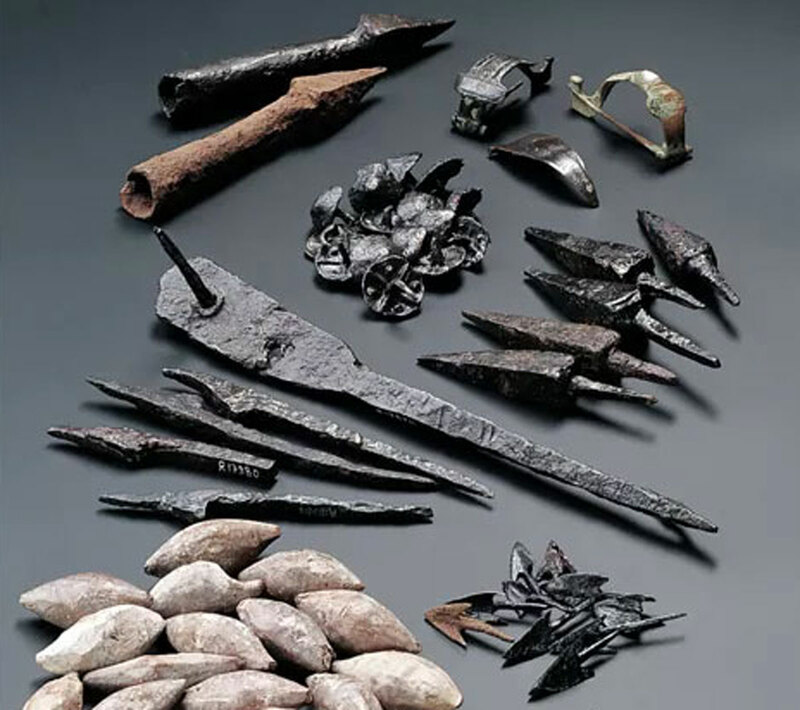 Numerous iron tips of catapult munitions, spears and various type of arrowheads and lead bullets (acorns) that were shot with slings and also hobnails, which Roman soldiers used in the soles of their footwear and clamps worn by Roman soldiers to fasten their robes, were found in the wider area of the archaeological site Grad pri Reki and towards the village of Police. These finds of roman weaponry and military equipment are extremely valuable due to their rarity and the history they tell of the Roman military siege. They were discovered in the exact location where the conflict took place In the area of the Archaeological Park Divje Babe, near the road from the Kazarska grapa gorge towards the turn for the road to the village of Bukovo, lies a burial ground dating back to the early Iron Age. They buried their dead here in the 1st century B.C. and during the beginning of the Roman period. The youngest graves date back to the time when emperor Augustus ruled (up to 14 A.D.) In these graves lay the descendants of the warriors who clashed with the Romans in the middle of the 4th decade B.C. in the area of Grad pri Idrijci. Among the items recovered from the graves are clamps for clothing, jewellery, weapons (helmets, swords, spearheads and parts of shields) and agricultural tools and axes.